Graveside services are scheduled for 2 p.m. Tuesday, Nov. 22, at Woodbine Cemetery for Brenda Sue Brintle of Artesia. 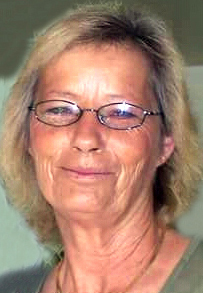 Brintle, 63, passed away Friday, Nov. 18, 2016, in Artesia. Pallbearers will be Chase Milligan, Chance Milligan, Jacob Luebke, Dakota Luebke, Trystan Milligan and Bliss Eric Owens. Brenda was born Oct. 14, 1953, in Albuquerque, the daughter of Archie and Velma (Bratcher) Tidwell. She came to Artesia in 1963 from Estancia. On April 13, 2000, she married Rick Brintle in Carlsbad. She was a scale master for Sweatt Construction and a member of the Church of Christ. Brenda enjoyed painting, walking in the desert, and spending time with family. Survivors include her father, Archie Tidwell, of Artesia; daughters Shanna Milligan of Artesia and Tammy Dicamillo of Carlsbad; brother Bliss Lee Owens of Carlsbad; sisters Linda Beadle of Artesia and Vickie Tidwell Davis and Carla Owens, both of Troy, Texas; grandsons Chase Milligan, Chance Milligan, Jacob Luebke, Dakota Luebke and Trystan Milligan; and nine great-grandchildren. She was preceded in death by her husband, Rick Brintle, on Oct. 23, 2015; her mother; and brother Ricky Owens.